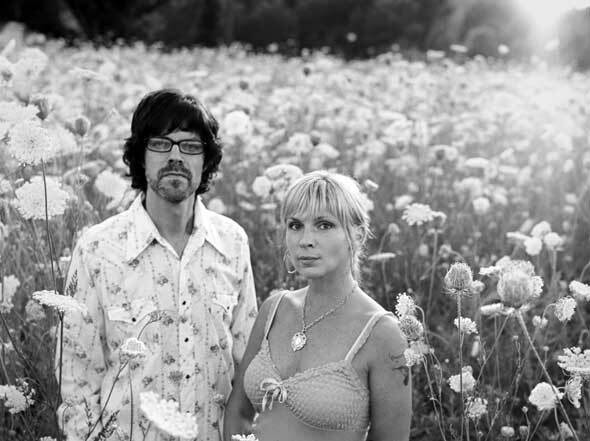 By some fans and critics standards, Over the Rhine have spent the last two and a half decades cruising “under the radar.” Primarily comprised by the husband/wife team of pianist/guitarist/bassist Linford Detweiler and vocalist/guitarist Karin Bergquist, the Cincinnati band released The Long Surrender on February 8, 2011, via the band’s own Great Speckled Dog label. Recorded in California, with Grammy-winning producer Joe Henry, and containing a duet with Lucinda Williams, the record was widely celebrated by the music press as stellar, raw, and perhaps the finest of the band’s “criminally overlooked” career. If sharing the stage with John Prine, My Morning Jacket and Bob Dylan, releasing 20 critically acclaimed albums, and touring as adjunct members of Cowboy Junkies is considered “under the radar,” may all bands be so lucky. I first heard about Over The Rhine years ago when the band was sort of championed by WOXY. Did they have a significant impact on your career in the ‘90s and early ‘00s? All the folks at WOXY were very supportive back in the day, and it was an interesting and innovative station, so it certainly didn’t hurt to have them behind our early records. Living with a significant other is one thing, but you also work together. Do your artistic differences ever create stress that carries over to life outside of the rehearsal? Some of our friends joke that if they were with their spouse as much as Karin and I are together, they’d kill each other within a week. It’s not for the faint of heart. Early on, Karin and I were both a little concerned that we might lose our ability to be objective with our music if we were romantically involved, but I don’t think that has happened. If anything, our songs have gotten better. We trust each other as editors, and we both are still working to grow as writers and performers. But yes, we started out with a good musical chemistry and that chemistry grew to include a good marriage. And we’ve continued to experiment with how best to take care of both a career and a marriage. It’s sort of like taking care of two gardens: they both need care and attention and creativity. Is next year the 25th anniversary of the band? Do you have anything planned to celebrate that milestone? Well, we started the band in the spring of 1989, and played our first concert with paid admission at Sudsy Malone’s in Cincinnati in the fall of 1990. So I guess we’re getting close. Holy smokes! I suppose we’ll do something to celebrate that milestone, but I find I’m currently not interested in being overly nostalgic. I’m more interested in making our next record the best one of our career. I’m more interested in the work I’m doing now. Over the years you’ve had the opportunity to share the stage with other wonderful musicians like Bob Dylan, John Prine, Lucinda Williams, etc. I imagine those experiences were validating as an artist, but di you ever have a “Wow, we’ve made it” moment during one of those events? I think getting the opportunity to open for Bob Dylan early on gave us permission to take out songwriting seriously. Ready or not, as writers, we were joining a larger conversation already in progress. But yes, of course, it’s been hugely gratifying to meet some of our musical heroes and make music together. What other milestones or goals would you still like to achieve? Well the wonderful thing about pursuing something you love is you can still be surprised even after covering thousands of miles. But we try not to get too uptight about expectations. Someone said, “Expectations are resentments under construction.” We work very hard to do interesting work that speaks for itself, but we don’t get to sit on the results committee. That being said, we do still dream, and one idea that haunted us in a good way is hosting concerts on our little hideaway farm, wich is about 45 miles east of Cincinnati. We’ll see. The Long Surrender is your latest, correct? What was Joe Henry able to inspire or bring out in a band who is already as seasoned and familiar with recording as you are? Yeah, The Long Surrender is our most recent project and a special one first and foremost because fans of our music stepped forward and paid for the project in advance before they’d heard a single note. So in a way, our audience bestowed a blessing on us before we headed west to South Pasadena to work with Joe. The exciting thing about working with Joe was that we couldn’t imagine in advance what an Over The Rhine record produced by Joe Henry would sound like. We wanted to be surprised, and I think Joe wanted something to be revealed as well that couldn’t be quantified in advance. It was an amazing week. Had you worked with Lucinda Williams before or was “Undamned” the first time? What was that experience like? We got to meet Lucinda for the first time the week we made The Long Surrender. Joe sent Lu the song, and she really connected with it. And she came over after dinner one evening and leaned into the microphone with Karin and recorded it. I don’t think there was a dry eye in the room. Then the wine flowed and we stayed up late listening to records and just talking. Have you begun writing for the next record? What would you like to accomplish with your next LP? Yeah, we’ve been writing hard for our next few projects. We are writing a record that loosely revolves around the farm we call home. And we are also working on our third Christmas record, called Blood Oranges in the Snow. Have you found it easier or more difficult to accomplish your goals as musicians by releasing your albums independently vs. via EMI as you did for so many years? We’ve always been fiercely independent in our overall approach, even when we were on labels. We just didn’t want other people messing with the music. We wanted the signal we were tuning in to be strong and uniquely our own, come what may. But yeah, in 2012, it makes all the sense in the world to be an independent recording artist. In most instances, record labels have made themselves obsolete. How much of your back catalog is typically covered in a headlining performance? What ground do you anticipate covering during your stop in Dayton? We still lean pretty heavily into The Long Surrender, because it feels closest to home, but we also perform new songs we’re working on. That’s always exciting. As far as our catalog, we currently draw mostly from The Trumpet Child, Drunkard’s Prayer, OHIO, Films For Radio, and Good Dog Bad Dog. With 20 albums under your belt you probably have some autonomy to answer this question without having to say the most recent one – Which is your favorite Over The Rhine album and why? It’s really hard to pick a favorite. We try really hard not to make the same record over and over again, and each project is connected pretty intimately to a particular chapter in our lives. But I’m pretty fond of the records that we have recorded mostly at home – Good Dog Bad Dog and Drunkard’s Prayer. I like the way Karin sings in the rooms that she wakes up in and lives in. We lost Elroy a few years ago, and he left a Great Dane-sized hole in our hearts. We named our record label after him – Great Speckled Dog Records. This past January we got a new Great Dane puppy named Minnie Pearl. She’s ten months old and weighs 125 pounds, so we have our hands full. Have you done and writing for another solo album? Has Karin ever done a solo album?